January 22, 2010 by Cary H.
I recently finished processing a set of records from the Kensington Soup Society (KSS). 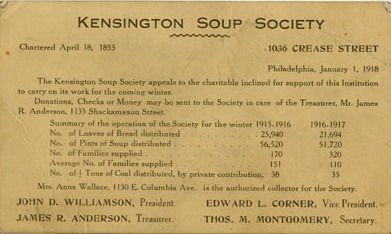 KSS, which closed in 2007, was Philadelphia’s last neighborhood soup kitchen. It was founded in 1844, at a time when there were other soup kitchens in the city, each one serving a particular neighborhood. In KSS’s case, its serving boundaries extended from (using current street names) East Norris Street to North Front Street to East Laurel Street to the Delaware River. Early on in its history, KSS offered food, rooms, and even work to its patrons. From the early 1900s to the 1960s, it also offered free coal to the most destitute. But KSS was first and foremost an establishment that served soup and bread to its neighborhood residents between the months of November and March. KSS’s records came to us in good shape, with most of the material being labeled or in labeled folders (yay! ), and the processing work fell mostly on the minimal side, though I did spend more time arranging several large loose groups of papers into the overall scheme of the collection (administrative papers, financial papers, and miscellaneous papers). The collection was also adopted by the organization—this helped pay for processing and conservation work. Now, one might expect that the records from a 163-year-old organization would span 163 years, but that’s not the case with this collection, which comes in at a modest 4.8 linear feet (8 document boxes and 13 volumes). The earliest records date from the 1860s and the latest date from 2009; but the bulk of the records cover the years 1870 to 1962 with, unfortunately, significant gaps. There are very few records from 1900 to 1930 and from the mid 1960s to the early 1990s; and those that do exist from those years are primarily bills and receipts. (Are the missing records truly missing? Or are they perhaps sitting in a former employee’s closet or basement? The world may never know.) 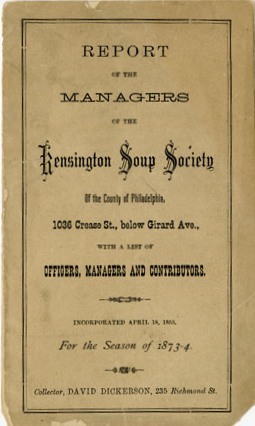 There’s very little out in the published world (web or paper) specifically on the society, save for a wonderful book by Kenneth W. Milano entitled The History of the Kensington Soup Kitchen (and even he, in consulting KSS’s papers, acknowledged the lack of records from certain years). Still, the collection provides a nice assortment of records that add to the study of the history of social service in Philadelphia, and also indirectly document the history of social conditions in Philadelphia’s Kensington neighborhood. The finding aid for this collection is now on our website. 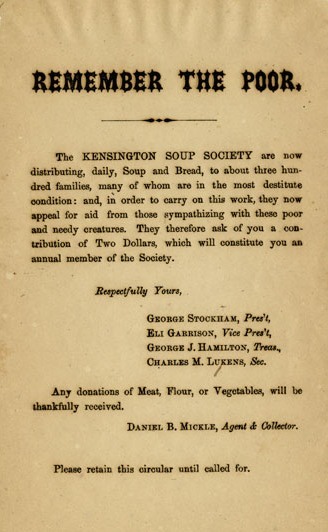 On a related note, HSP also has a collection of records from Philadelphia’s first soup society, the Southwark Soup Society (Collection 3024), which was founded in 1805.